I had assumed things would calm down a little once we got moved out of the house. Josh and I have both been on overdrive, him with work, and me with getting our life changes in order while also squeezing in work when I can. Ardent Camper-related happenings in the past week boil down to two categories: the truck and the RV. We're saving for another post information about the process Josh has been going through to set up our mobile internet needs. It has involved many hours on the phone, but the awesome payoff of affordable, unlimited, unthrottled data through Verizon. For the full explanation, join the (well-worth-it) Mobile Internet Aficionados by Technomadia. It's a Ford F-350 with four wheel drive, dual back wheels, a crew cab and a long bed. It's seriously, ridiculously huge. Considering the biggest car I was used to driving was a RAV4, this is new territory. We traded in said RAV4 and our Civic for the Ford. 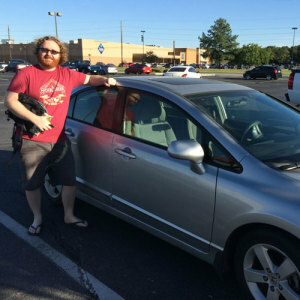 I was really sad to see the Toyota in particular go, because it was so faithful in carrying me on outdoor adventures during the last 10 months. I even slept in it twice while camping to avoid lightning storms and flooding. The first few drives in the truck have been uneventful, although we have noticed an odd sound coming from the dash that we're getting checked out. 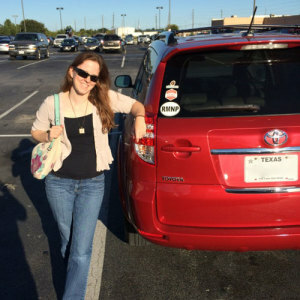 We had a great, low-pressure buying (and selling) experience at CarMax, and we're hoping the customer service remains top notch as we take the truck back to them for a tune-up. CarMax provides a 30 day guarantee for all vehicles, and it looks like we'll be taking them up on this. 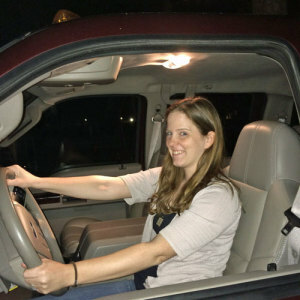 If I looked terrified posing in the truck, it's because I was. 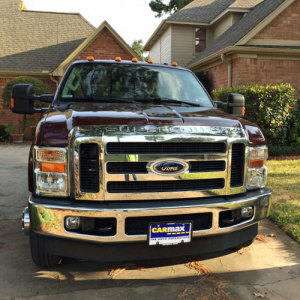 I'm feeling a lot more comfortable with the F-350 now that I have successfully driven the truck all over Houston. If it's not bad enough that the city is a perpetual construction warzone, it has was dubbed the 2014 Road Rage Capital of America. The truck provides pretty impressive visibility (probably because I'm sitting approximately 47 feet in the air), and except for some narrow lanes here and there, driving isn't as scary as I thought it'd be. Getting used to driving while towing the 5th wheel will be yet another challenge, but we're taking it one step at a time. When we bought our RV from PPL Motorhomes, we hired the highly professional Morris Starks (B.A. Happy Camper) to tow it to the storage facility we had rented. Morris mentioned the tires looked pretty old; Josh and I agreed we would have them changed as soon as possible. This past Saturday was to be the day. It was cool and crisp, and we got up early to get started. Since we had just bought the truck and didn't have a 5th wheel hitch installed yet, we hired Morris once more to tow the 5th wheel to Best Preowned RV. There, we were planning on having new tires put on and other adjustments. Sadly, the tires couldn't even make it the 20 miles required. After limping off the highway, Morris gave me a call to report the RV had had a blowout. What's more, the blowout had damaged the trailer skirt. Although this obviously wasn't ideal, we figured there probably wasn't much avoiding this. That tire was gonna blow as soon as it started moving, no matter what, so unless we'd had the ability and know-how to change it on the spot, the outcome was inevitable. We were just grateful that it had happened in the capable hands of Mr. Starks. 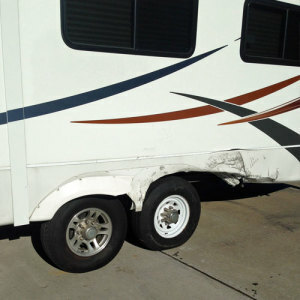 He put the spare on and towed it carefully the rest of the way, noting a few other issues the folks at Best Preowned RV should look into. 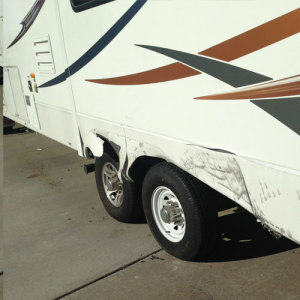 Even more fortunately, the only damage to the RV was completely cosmetic and should prove inexpensive to repair. We're looking forward to attending the Escapees RVers' Boot Camp in a couple of weeks, by which time our truck and RV should both be ready for their maiden voyage. Any advice before our first trip? None of the businesses mentioned have provided us any kind of compensation or incentive to talk about our experience on our blog. All the opinions are our own.